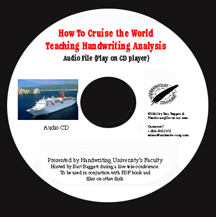 How You can Cruise the World for Free by Teaching Handwriting Analysis. If you have ever wanted to go on a seven, ten, or fourteen-day cruise FOR FREE... this is your chance. Cruise Ships need speakers and there is a shortage of qualified handwriting experts to teach classes on board ships right now. How do I know this to be true? Because I (and 2 members of Handwriting University's Faculty) just took a seven-day cruise to Alaska in exchange for our skills as speakers. We all took our VACATIONS at different times and we all had a blast. Every time I talk to my booking agent, Diana, she says "When are you going to send me more handwriting analysts to go on the other cruises? I have one for the Bahamas, one for Mexico, one to Russia, etc." So, I've decided to reward my favorite students (those who graduate are my favorites) with a referral and FOUR complete presentations using PowerPoint, along with the complete business KIT that explains the step-by-step method for getting yourself booked as the "guest lecturer" aboard the ship of your choice. Follow my instructions, listen to the audio instructions, and you will be traveling the world for pennies! and Cruise Ship Agents' info pack. Bart Baggett, leading a seminar on handwriting analysis. Above right, the first boat on which Bart taught handwriting analysis in 2003. Yes, I want to go on free cruises and teach handwriting lectures. Send me the new CD and show me how! 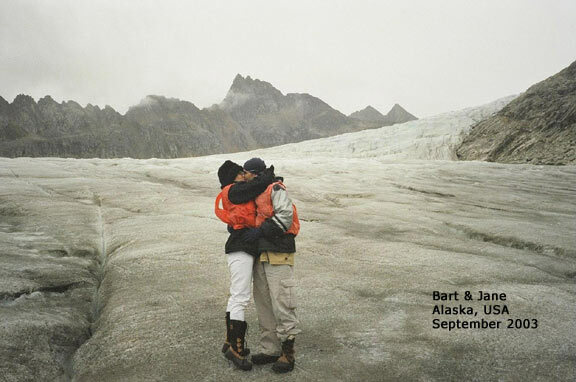 10,000-year-old Glacier, while the ship was docked in a nearby Alaskan port. Your romance may vary, depending on whom you choose to travel with. Now, in order for you to be an "enrichment lecturer," you must be a trained handwriting expert and a decent presenter. You don't have to be great - you just can't get POOR audience ratings if you ever want to come back. We don't judge or ask to see your credentials before we will sell you this course. But, if are not enrolled into Handwriting University's Certification Level Home Study course, we request that you get enrolled first, before you use our PowerPoint slides that contain our logo. I have created FOUR lectures based on my 20 years of handwriting analysis experience, using graphics, photos of the Grapho-Deck, handwriting samples, and sections of my courses to provide a full and easy teaching experience for you. Just plug in your laptop and you are set to go. 1. One 45-minute teleconference revealing the ins-and-outs of the deal. 3. The limited rights to use the above presentations in your lectures. 4. The handouts in PDF format and Pagemaker, which you can adapt for yourself. 5. The names of four different booking agents who specialize in cruise line speakers. 6. A referral from me. 7. A complete follow-along "Special Report" with scans of tickets, phone scripts, agent info, letters, on-board newsletters, instructions, and all the resources you need. P.S. Another one of our faculty members, Anne Bedinger, just booked a 12 day cruise to Hawaii on NCL cruise lines. While not totally free, the booking/agent fees for her and her Mom averaged out to less than $28 per day, while full-paying customers paid over $150 per day for the same type cabin! Plus, all her meals were included! 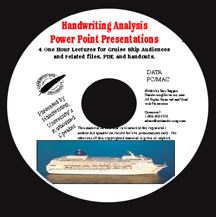 If you can teach handwriting analysis, there is a Cruise Ship audience waiting on your skills. Cruise Ships leave ports every week, 52 weeks of the year. If you have any questions, please call our office ask for our Course Information Specialist.